We are looking for a few key people to work weekends and some weeknights. Must be 18 to Retired. New England Airgun has the largest selection of airgun products in all of New England. We have a warehouse that we can ship direct to your home if you can't make it into our store, With direct accounts with many manufactures we have the best of the best products from Airforce airguns - Fx Airguns - Vortex Optics (coming soon), Crosman/Benjamin/Sheridan Airguns - Raw (Rapid Air Weapons) - Leapers/UTG Optics and accessories - RAI (R Arms Innovations) - AirHog Carbon Fiber air tanks - Kruger Targets - Birchwood Casey Targets, Laser Training pistols and software, and more.. Here is some more, our airgun supply has expanded! Airsoft or Paintball anyone? Yes they can be powered with air or electricity. We are building our selection of guns, accessories, parts, and supplies. We buy direct from Tippmann and Ninja Paintball and have warehouse access for everything else. Many have come to us looking for airguns for personal protection as a less-lethal option. We have taken that to what believe is a better option, Pepper Gel and Pepper Spray products From Sabre. We also have an airgun option that shoots Pepper Balls with authority 50 feet or more. Looking for a safe alternative to target shooting in the back yard? How about a different activity, something for even a rainy day, Team Building? Ever thought of being on a rifle or pistol team and competing? ​How about casual competition with your friends playing shooting games like Darts , Pool, BattleShip, Tic-Tac-Toe, Golf, Fishing, Plinking targets....or a moving target? What is New England Airgun in Hudson MA? New England Airgun is an Indoor "Lead-Free" "Environmentally Friendly" Air Gun target-shooting-range and Pro Shop. We shoot at "targets only" and not at each other as in Paintball or Airsoft. We concentrate on Marksmanship skills through game targets and NRA / ISSF Competition targets, and hopefully some day precision electronic targets like you would see in the Olympics. Our range can handle .177 .22 and .25 calibers of lead-free ammunition. (this includes plastic bb's used in airsoft and metal bb's common in bb-guns.) Lead-Free, Alcohol-Free (no-Alcohol not free-Alcohol) and we still have lots of fun! We have a full ProShop where you can touch and feel the products and even rent and use them before you make the decision to purchase. No License needed for Air rifle or Air pistol in Massachusetts, but you must be supervised by a parent or legal guardian if under 18. You can practice target shooting at New England Airgun if you're not legally prohibited from handling a gun of any kind. Too Hot, Too Cold, Too Wet, Too many bugs. Looking for something different to do and get out of the weather for a while, give our indoor Air gun shooting range a shot! Bring a friend and compete for who buys dinner. Hi powered for hunting or correct powered for target practice, Rent a lane and rent a gun, if you like it you can buy it. We have a large selection of unique Pellet and BB guns you can rent or purchase from our ProShop. We have a good selection in stock and can order just about any air gun product you can find. Shooting practice, Competitions, and Games, Year-Round in a clean and environmentally controlled venue. From Olympic competition Rifles and Pistols to powerful hunting rifles and everything else you could need. We have beginner products for the kids getting started too. Teach them right, shooting should only be done at proper ranges designed for the sport and proper locations outdoors with permission from the landowner. Remember when shooting outdoors to respect wildlife and others enjoying the outdoors. Hunting animals is only legal when in season and with a proper licence. Come in and Learn to Shoot! Pistol or Rifle, Iron sights, Scopes, Red Dot. Airguns with Lead-Free Pellets or BB's are a clean, can be quiet, without the recoil of a Firearm. (High Pressure compressed Air "HPA" or also know as Pre-Charged Pneumatic "PCP", Single or Multi-Pump, and Co2 powered. For those who like the challenge of controlling the recoil of a Firearm, we have "Adult Airguns" Spring and Gas Piston rifles and pistols with "Kick!". Come in and test your skill with these Break-Barrel Rifles and Pistols. Win Prizes!! No License needed for Airguns. You can practice here if your not legally prohibited from handling a gun. Range time is $15 per hour - Per shooting stall, additional people can be added at $7.50 per hour each up to 4 people per lane Maximum. Guns are $5 for basic or $30+ for competition grade. Plan on about $45 per person or less if your share or have some of your own supplies. Individual yearly membership is $250 - includes all range time and member only discounts and benefits. Family yearly membership is $550 for up to 4 people (2 adults max - 3 under 18). $75 for each additional under 18. Includes all range time and member only discounts and benefits. From learning the basics to fun games to precision concentration. Become a yearly member and get unlimited use of the Range. Just testing the water… rent for the day and experience the fun! Eyes - eye protection, if you have plastic lense prescription glasses your good. Ears - ear protection is required as a good habit for all shooting sports. with multiple people shooting the sound multiplies. Lead-Free Ammo - Pellets or BB's - we have a large variety of pellets available in many shapes and sizes. Case - case your gun in a box - bag - or gun case when you are traveling to and from the range. we can't let you walk around with an open gun of any kind in the parking lot or building. We have rifle and pistol sleeves starting at $5 , soft and hard gun cases too. Clear barrel indicator - we have some - it's just a bright cord thru the barrel and action to visually show from a distance that your gun is safe. Band-Aids - guns are metal and there are pinch points to be careful of. Last is a good attitude and patience with a willingness to learn. It take time, technique, and concentration to accurately hit targets that are from 17-20-30-50 feet away. $5 rebate - Crosman 1077 a lightweight 12 shot semi-auto air rifle (12 shots as fast as you pull the trigger. 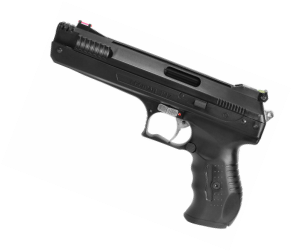 Great for rapid-fire target shooting and with an impressive 780fps it can be used for small pest elimination. Pick here to see more products we carry or come in as we have even more in the ProShop. we provide them at full pressure "4500 psi" and fill them when they're empty. High Pressure air and Nitrogen are virtually the same. The air we breath is mostly Nitrogen. Commercially the nitrogen comes to use cleaner and drier than compressing air on-site. Nitrogen is more stable under temperature changes and will work better under extreme heat and cold. We also fill the full sized scuba and scba tanks to 3000-4500 psi. ​Under 1500 psi and first time fills are $20 for tanks over 90 cubic inch, fill time is over 60 min plus cooling plus top off. it is best to leave the large tanks overnight. high pressure, long fill time, creates a lot of heat. if you don't leave your tank to cool and be topped off you can expect to lose at least 500 psi when the tank is cool, we can't overpressure our compressor to compensate. HPA 4500psi and CO2 tanks. New England Airgun is now your local Ninja air products Dealer! Quality American made products and Services. ​We call these pony tanks, they are very small and hold lots of refills for in the field use. Unregulated with a slow fill valve so you have control over fill speed and shut-off. Regulated to 3000 or 2000 psi do you don't over-pressure your air pistol or air rifle. Regulated to 800 psi for airsoft or paintball. The UL Regulator ships at 800psi and comes with the ability to adjust your output pressure from 500psi, 650psi, or 800psi. First fill is on us, when you purchase one of our tanks. Under 1500 psi and first time fills are $15 for tanks 90 cubic inch and under, fill time is approx. 30 min. Refills on tanks holding over 1500 psi are $8 for tanks 90 cubic inch and under, time required for a top-off refill is about 10-15min. Precision rifle and pistol shooters, are you looking for a Warm, Well Lite, and Clean location to practice on your own or as a team? Come see our existing range that is adjustable from 10ft (3-meter) to 50ft (15-meter) distance. We have the ability to expand and include up to 13 more 10 meter lanes just for Precision shooters. Electronic scoring, yes we can do that, just come in and show us you have the interest. See our Products page for some of the products we have in stock. We can get you almost anything, if you don't see it, ask us. we can order most every make and brand. One lane setup with the Chrony and lights so you can see what your pistol or rifle is putting out for speed and consistency with our lead-free pellets or airsoft pellets. If you want to see how your airgun is doing with lead, you can purchase a Chrony from us and find a place to shoot that allows lead. If you like action shooting we have these systems for rent in our range for $10/hr and for sale in the store for $310.00. come in within 2 weeks of your birthday, with positive id, and you get free range time and the Airgun of your choice to use. Not sure what to Give or Get for a Birthday present? How about a Gift certificate for our Store and Range. Gift Certificates are the Gift that gives options! With us you can try-it before you buy-it, Rent a lane and rent a gun, give it a try, if you purchase that model, we will refund your rental fee on the gun. We may even take in your used equipment on consignment or trade-in. See out Products Page for some of what we have in stock. Curious about how loud the range is? Check out the video below! Upgrades and Mods, yes we do them. Trigger adjustments, Accessory Mounting, Sight Adjusting up to 50ft, Seal Replacements in Guns and Pumps. Spring replacements. Benjamin and Sheridan multi-pump seals in-stock. Feinwerkbau FWB springs and seals - Yep we do them. We are now your Local Celestron Optics Dealer. From Spotting Scopes to Microscopes and Telescopes, come in and see how we can help you with your Bird Watching, Hunting, and Astronomy. 177 .22 or .25 cal we have Ammo (Pellets) in-stock and Airguns for you to rent or purchase. 6 15-meter lanes (50 feet). rifle and pistol. Adjustable to 10-meter lanes for Olympic distance shooting Competitions. Shooting stalls for Standing - Sitting - Kneeling - Prone. .177 to .25 cal - Pump, Break Barrel, CO2, and PCP. Carriers for up to 17 x 22 targets. Large format printer on-site for custom targets. Future expansion to include: 5 6-meter lanes (20 feet) for pistol and shooting gallery. Currently will be a sitting / social area. Large parking lot to accommodate all, including teams with buses! We have a dedicated repair shop and part time repair person for your airsoft upgrade and repair needs. Alex will be helping with other airguns also, but his specialty is high-end airsoft. Drop-off service is preferred but Premium service can be made available while the Air-gunsmith is on duty. We will also be bringing in some of the better brand airsoft rifles and pistols. If you have a favorite, let us know. We've been approached by a few groups that have shown interest in using Airsoft guns at our location. After some education and research it looks like we can accommodate the Airsoft community for Target Practice Only with one restriction. Use of Propane and Green Gas is Prohibited due to flammability of the Gasses and ventilation requirements in our space. HPA,CO2, AEG, Spring, Spring Battery are acceptable products to use in our range. We do have some airsoft rifles pistols and accessories in-stock and can order to fit you needs. Pick Here to see the latest Action Sports Games products. 2019 @ New England Airgun. Let us know your interested in this class by filling out the form below. Class is typically 4-6 hours and we do Live-Fire airgun style! Learn to shoot accurate before you have to deal with the recoil of a firearm. We also have Laser training guns so you can first learn by shooting nothing but light and have the computer record how you are doing. Move up to a non-blow-back pistol then to a blow-back pistol so you can get the feel of a firearm. Fee is $115 includes lunch, range-time and supplies. Must be paid 2 weeks in advance for the officer to clear their schedule for the class. Discounts for groups of 4 or more. how many people in your group, including yourself, will be taking our class. What is a "Adult Airgun"? Well Ralphie, it's not the Red Ryder bb-gun you got for Christmas. The Red Ryder (Manufactured by Daisy) is a dependable lever action, single shot, spring powered air rifle that shoots bb's at a velocity of 350 fps (feet per second). Adult airguns can be powered by many sources (Compressed Air, Spring, Nitro Piston, CO2). Some are capable of shooting speeds above the speed of sound (1100 fps at sea level). 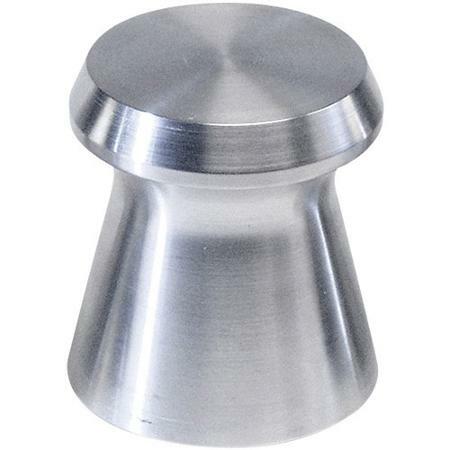 They are also very accurate, precision pieces of equipment that shoot pellets and have prices that can get into thousands of dollars depending on the quality and options. Many airguns are replicas of popular firearms models, Some are just futuristic pieces of art and ingenuity. What is a Airgun BB? 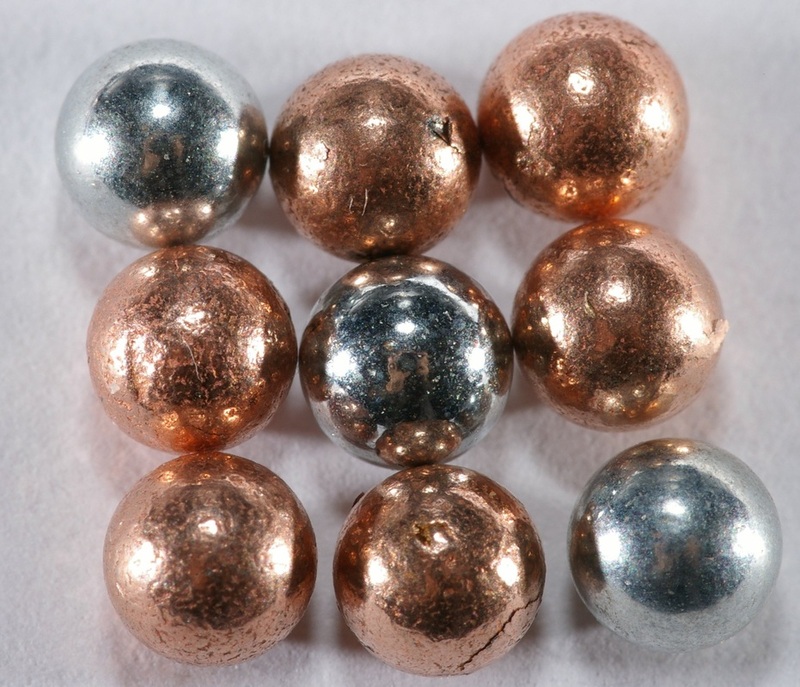 The BB is a steel ball with a copper or nickel protective plating. There are all grades of bb's. some are precision manufactured and others have surface imperfections that decrease accuracy. While some bb's fly straight to the target, other act like a baseball pitchers curve ball. Depending on the type of shooting practice you are doing, BB's are good enough and very affordable. I personally like to practice with a bb pistol before shooting competition airgun or firearm. The spring force of the air pistol is a good workout tool to increase strength and wrist control. What is a Airgun Pellet? The Airgun Pellet is shaped like a badminton birdie or shuttlecock. This aerodynamic shape combined with the rifled barrel of the airgun help the pellet fly straight and accurate. Rifling spins the pellet much like a football play spins the football to make it fly straight without wobble. Pellets are now being made in Tin and Plastic/Metal combinations to protect people, animals, and the environment from adverse effects of traditional Lead pellets, and the possibility of Lead poisoning. As manufacturing techniques improve, so does the accuracy of the Lead-Free Alloy Pellet. Initial production results were not impressive, but todays alloy pellets fly with impressive accuracy. Lead-Free: no special handling or cleanup. Recoil-less: get centered on target without kickback. Muscle Memory: Get on target without recoil. Controlled Temp: No large ventilation system. Replicas of common firearms available. No dis-assembly or Cleaning of guns required. As in many sports, Muscle Memory is a large part of performance, Baseball Pitchers don't have sights, scopes to throw the ball to the catcher, they use muscle memory from years of practice. A Quarterback on football relies on the same muscle memory for precision passes and long range touchdown passes, it's not luck it's practiced muscle memory. The same Muscle Memory is needed in the shooting sports and personal protection. What better way is there to practice the fundamentals of getting your shots on target than with a gun without kickback or recoil. Get your muscle memory on target before adding the recoil of a firearm and you will be on-track to being a better firearms shooter because you know that you are really on target. Lead = is a neurotoxin commonly used in bullets and some pellets. Lead Poisoning = Caused by ingesting lead and lead dust. Tin = Lighter and safe alternative to lead. (the pellets we use). the air we breath 78% nitrogen. HPA - High Pressure Air - (compressed air or nitrogen). We have a solution to your gift giving "What to give them this year" question. A Gift Certificate to New England Airgun where can spend hours playing real gun games and get out with real people instead of online play with the Xbox or Playstation. ** accurately = 4 in target @ 20 feet, 31 of 36 times. it's not Olympics worthy but it's a good start! ^^ Q: Is a license required to possess an air gun (i.e. bb or pellet guns, so-called air rifles or air pistols, paint ball guns) or ammunition therefore (i.e. bb's, pellets, CO2 cartridges, paint balls)? A: An FID Card is not required to possess an air gun in Massachusetts. Air guns are regulated by M.G.L. c. 269, §12B which limits their use by minors who are not accompanied by an adult, holding a sporting or hunting license, or holding a permit from the chief of police. Massachusetts law also prohibits anyone from discharging air rifles from across streets, alleys, public ways or railroads or railway right of ways. It should also be noted that an FID Card or an LTC are not required to purchase an air gun or ammunition. As such, the state FA10 form should not be used to record the sale of such air guns. "Air Guns are for target practice Only". They use metal pellets or bb's and shouldn't be confused with Air Soft Guns that use plastic pellets that are designed to be used similar to Paintball Guns. Remember: All guns are "real guns" and every gun must be treated "at all times" as loaded and ready to fire. Color and physical features don't make any gun more dangerous than another - only the person behind the gun can assure it's use is safe or not. The Responsibility is Yours! Finger pointed as a gun is a gesture. (combat simulation - no protection). Stick pointed as a gun is a gesture. (combat simulation - no protection). Cap-gun is a gesture with noise. (combat simulation - no protection). Squirt-gun is person to person (combat simulation - no protection). Foam Dart Gun is person to person (combat simulation - eye protection). Paintball is person to person (combat simulation with proper protection). Airsoft is person to person (combat simulation with proper protection). Airguns (BB and Pellet) are for Target practice - Hunting. Firearms are for Protection - Hunting - Target practice. Do you have an unwanted airgun in your home that you just want to be gone? Drop off your BB gun or Pellet gun at New England Airgun and we will take care of it. Any kind of gun, mace, pepper gel, pepper spray, pepper powder, or other weapons have different restrictions when you pass from town to town, city to city, state to state, country to country. It is up to the person who wishes to protect themselves with any kind of lethal or non-lethal weapon, to know the laws where they are traveling from and to. Remember, your not protecting your "stuff", your protecting yourself. If you are looking towards a gun (lethal weapon) so you can stay at a distance to protect yourself... most laws figure if you're that far away, you aren’t protecting yourself and your first line of defense is to run away. The first step in any person protection is being able to keep the other person away from the weapon and give yourself time to properly prepare it for use while under attack. Martial arts or similar training. Once a weapon is in the battle it becomes available to all in the battle. If you think you need to protect yourself with a weapon, maybe it's time to change what your doing or move away from the danger you think you need to be protected from. If you can't, then it's time to find an attorney and get professional legal advice so you can prepare for all outcomes. Q: Would an airgun be effective in fending off an attacker? A: Depends... even criminals hit with a .45 cal firearm with one shot aren't immediately down and out. Why do the police take many shots when fending off and disarming a criminal with a weapon? Could be that they might miss and need follow up shots to make sure one hit it's mark? or could it be that it's not all that easy to stop a person determined to do harm with a weapon? Any kind of weapon inflicts pain in an attempt to disarm and can even cause death with a single hit if it's in the right spot. Different people can tolerate different levels of pain. Some can't handle a needle from the doctor and some continue to play sports with broken bones. We hope this didn't answer all your questions but gave you more to think about before you contact a legal professional to get an answer that is good for your situation. At New England Airgun we are focused on the personal enjoyment of marksmanship, competition, and target shooting. We do have customers that enjoy hunting with airguns and it's up to them to follow all the hunting and gun laws for the town and state they are in. For Legal Advice on Personal protection find yourself a good Attorney. If your still interested in pepper gel-spray-powder products for Non Lethal protection, we now carry some for your convenience. Visit our Personal Protection page for products you can't get by mail order in Massachusetts but you can pickup in our store.